While TeamSnap has employees working all over the country who can keep the company afloat, some at TeamSnap Headquarters are located in Colorado’s Front Range and have been working to cope with the downpour and flash floods. Boulder, CO, home of TeamSnap HQ, where a bike path under this bridge is flooded. TeamSnap’s Inside Sales Manager Abe Bergan lives in Lyons, CO, a city that has been evacuated by the floods on Thursday and Friday. On Thursday morning he quickly warned management and other commuters into Boulder about the struggle of rushing waters in the area. Our CEO Dave DuPont also notified the rest of the company and told commuters from the Greater Denver Area to stay home and stay dry. “Everyone that is except Abe and Keeva, who in the wee hours this morning were awaiting evacuation orders,” he said. Keeva is our office dog. Lyons, CO, home of Inside Sales Manager Abe Bergan. TeamSnap’s Headquarters is located on a second floor building in Downtown Boulder and is in fine condition, but we can’t say the same for the building’s basement. On a week like this, working at an internet-based company and having the ability to work remotely allows us to still get our work done during these times, but more importantly, it allows us to be more readily able to then attend to our personal needs and assist our community with the debris. Read these personal anecdotes from TeamSnap employees who were directly affected by the flooding, and keep the community near Boulder HQ in your thoughts and prayers! Boulder Creek Flooding near CEO Dave DuPont’s home in Boulder, CO.
We have been working pretty much straight out the last 96 hours and just finished up the cleanup from the damage. Wednesday night we realized the rain was really accumulating and starting bailing out our window wells and making sure our drains were clear. They were overflowing anyway. Thursday morning we woke to about six inches of water in the basement and we immediately moved all the furniture to our garage or outside. The good stuff went into the garage, the ruined stuff went along the side of the house. Then I went to buy a pump. I was still locating a hose for the pump when I spoke to Pat Thibodeau from Computerworld about how Boulder’s tech workers are coping with the historic flood. The good news is that I found a pump at all; as you can imagine they suddenly got very precious. There were probably about 500 pumps in all of Boulder and suddenly the city needed about 20,000. The bad news is that the pump did not have an automatic shut off switch. I spent the night getting up every hour to either shut off the pump when the water got low, (because sump pumps burn out unless they are in water), or turning it back on because the sump well was about to overflow into the basement again. Fun times! Friday we started the cleanup, which continued until a couple of hours ago. Ripped out all the carpet, carpet pads, drywall and insulation; and hauled same outside. My whole body hurts. Everyone in the neighborhood was more or less in the same boat, no pun intended; and we all helped each other carry heavy stuff out of basements, loaned each other tools and shared food for communal meals. Everyone really came together. Woke up at 1:11am to a disconcerting sense that something was wrong. Rain was consistently falling and a steady stream had begun to course past our house within 10 feet of the garage door. Checked the river, level seemed okay at the time. Back to bed. 2:20am, I am awoken by the deafening sound of the flood siren and an inaudible voice over the loudspeaker that sounds like Charlie Brown’s teacher has taken control. Cell phone is blowing up with alerts for areal flooding. Lyons evacuation from the river area is imminent. I have never witnessed firsthand such raw, destructive power of Mother Nature. The N. Fork of the St. Vrain that had dwindled to a mellow late-summer stream, was now carrying houses, 800-gal. propane tanks, cars, trees, and a slough of personal belongings in a frothy, raging mess through Lyons. What turned from intrigue, quickly became despair upon realizing the magnitude of destruction and loss. Both mountain highways leading West from Lyons have collapsed into the river, most homes on the south side of the river are inundated with flood water and sediment. There is no infrastructure to sustain a community at this point. Following self-evacuation on Saturday, I am being told that Lyons residents will not be able to return for up to 4-weeks. Winter is coming soon; this is going to be a tough one. I was in Santa Barbara at an affiliate marketing conference. I started to hear about the increasingly dire reports about rain and flooding from my wife and son as well as the Daily Camera. By the time I realized how serious it was, there was no option to fly back nor would I have been likely to get into Boulder from the airport. Our house was totally dry, but water damaged several neighbor’s houses and created a river in the road 1/2 block from my house. I flew back Friday to find that half of Boulder was unscathed while the other half looked like it had been submerged. 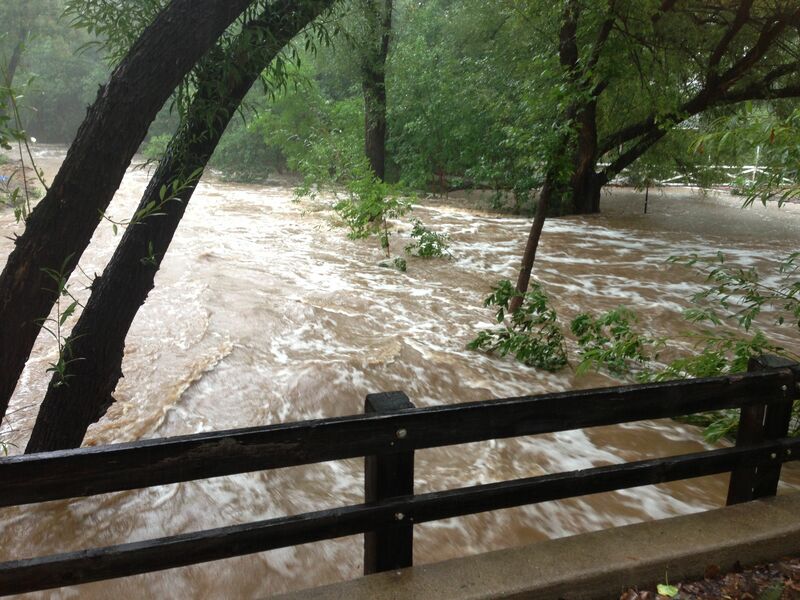 Office Manager Whitney Althouse takes this photo of Boulder Creek near her home in east Boulder. VP of Engineering Frank Watervoort stands in front of a communications rack while volunteering at the Colorado State EOC. The Colorado floods are unprecedented in many ways and are unfortunately resulting in loss of life and tremendous damage. In some areas, all communications infrastructure has been washed away, and the only reliable means of communication is Ham Radio. I am part of a group of well-trained volunteers that assists with communications in times of need. Some of us are working at the Colorado State Emergency Operations Center to assist with communication between the Red Cross and various active shelters. There, we mostly deal with coordination of supplies, health and welfare messages, and related communications. Our group is also assisting the National Weather Service with monitoring of rivers & streams and providing rainfall totals for various areas so that accurate flash flood warnings and related communications can be prepared on a timely basis. More information at http://www.arrl.org/ares. The Colorado State Emergency Operations Center (State EOC). We thank you for your support during this time. Some additional updates will be posted via our Facebook page at www.facebook.com/TeamSnap.